Want to sign your documents using your iPhone? Well, there is now an app for that! iPhone is a highly capable device that can help you prepare all your documents, fill all sorts of forms and electronically mail them via the Mail app. But it doesn’t allow you to endorse your signatures on them. 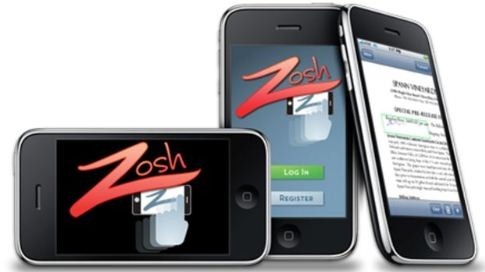 Finally, Zosh has come to the rescue by introducing its new app for iPhone. With Zosh, you can take all those email forms, fill them in, and sign them right from your iPhone and send it back using email. No more printing, signing and faxing required. This new innovative application also lets you fill in PDF documents, insert text, dates and signatures using the patent pending signature tool. 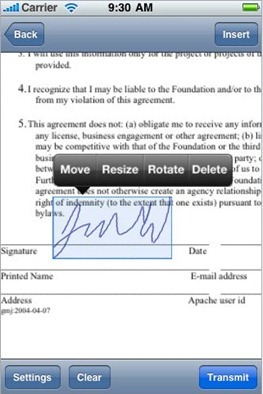 Signing of documents is done by using finger on the iPhone screen. The completed documents with signature are transmitted as standard PDF files as illustrated in the video below. Zosh truly is a very useful iPhone app and it is available for just $2.99 from iTunes App Store. The signing process is simple, easy and it works intelligently. The signature line auto tracks your finger which means that if your signature goes larger than the iPhone’s screen, it’ll simply pan over. However, there’s one serious limitation at the moment. You can only sign PDF documents, not document or text files like .docs or docx. The remedy for it may come soon.